Sensational singer, Simi has joined the many Nigerians in discussing the trending topic on internet fraud. Some days ago it was reported that Style Influencer, Noble Igwe ‘snitched’ on yahoo boys, exposing their scheme to the Economic & financial Crimes Commission (EFCC). The story has since stirred controversies in the Nigerian public. 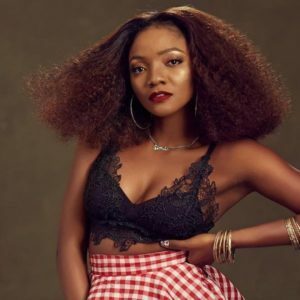 However, Simi has joined those who support the view of the media personality and blogger. She expressed how disappointed she was that some Nigerians were defending fraud in the country. She stated that internet fraud has caused Nigeria a bad image around the world and the action should not be justified. 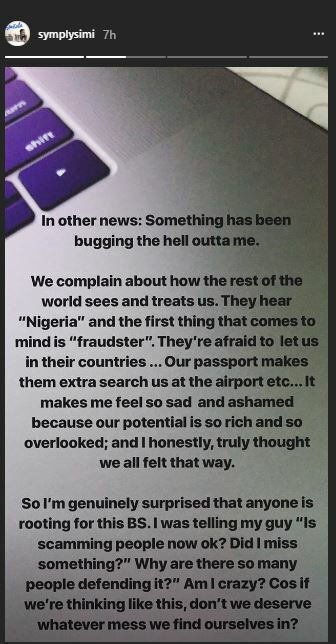 She shared on her instastory her view on the issue and how we as a nation should react to it.